We are thrilled to have Danica Favorite with us today. She’s here to tell us about her new Love Inspired series and the experience of writing her first contemporary stories for Harlequin. My process has evolved a lot over time. Generally, it starts with the gem of an idea, and then I will spend a lot of time- weeks, sometimes months, thinking about it and processing it, then researching the idea. I always have a notebook on me, and I spend a lot of time jotting down notes and thinking through the story on paper. I think best using pen to paper, which makes this an important part of the process. Once I have all the pre-work done, I will handwrite the synopsis. I typically do a synopsis for the whole series, then each book in the series. This is partially because I send in proposals for a series, so I like to have all the work done up front. But also, if I don’t have it all down at once, by the time I get to a later book, I’ve completely forgotten what it’s about. Once it’s all handwritten in my notebook, I’ll handwrite at least the first scene. Again, this is because it helps me think through things better. Anytime I struggle with the story, I always go back to handwriting. Finally, I transfer it all to my computer. I was in a car accident a couple of years ago, which made being on the computer harder, so I now dictate when I write. Writing the actual book goes fast. I tell people I write fast, but I can only do it because I’ve done all that prework to start out with. I refer to my notebook often. I usually start each writing session by editing what I dictated the previous session, and then I continue on in the book. By the time I hit the end, it’s pretty close to being the final draft. I try to let it sit for at least a week or two (which isn’t always possible due to deadlines), then do a final read-through to look for mistakes and the common things I know my editor will point out. 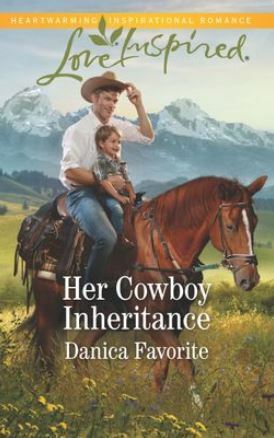 Her Cowboy Inheritance, your February 2019 Harlequin Love Inspired title, is the first book in your new Three Sisters Ranch series. Can you tell us a little bit about these books and what inspired you to write them? Three Sisters Ranch is about three sisters with no ranching experience who inherit a ranch from a former stepmother. They’ve always wanted to live on a ranch, and have all experienced recent tragedies in their lives, so the ranch is a perfect place to start over. Of course, ranching is not as easy as it looks, and they have a lot of lessons to learn in the process. And of course, it’s all complicated by falling in love. I was inspired to write the series when I had a conversation with one of the Love Inspired editors after Love Inspired Historical closed, and I asked her where she saw me fitting. She told me that she’d really like me to write cowboys and kids. Cowboys because they’re popular and kids because I’m good at writing them. Confession time: I’m not a cowboy fan. I grew up around cowboys, livestock, and all that, and ran as far as I could from that lifestyle. But then I had kids, who super love horses, and found out, after fifteen years of marriage that the city boy I married has always wanted to be a cowboy. So I’ve reluctantly re-joined that world. But that’s what love is. You do a lot of crazy things you never imagined you’d be doing because you love someone and want to support their dreams. And, you find that some of the things you thought you hated aren’t so bad after all. However, horses still stink, even though I love them, and I’m still looking for ways to get the sweaty horse stench out of my house. All that to say, I’m given plenty of inspiration for my books on a daily basis. Going back to the books, I thought the idea of having people who knew nothing about ranching was the perfect place for me to start. I might have grown up in that environment, but having been gone for so long, I’ve had to re-learn a lot of lessons, and my husband and children are learning as they go. Trust me when I say we have made a lot of mistakes! Many of the adventures my characters have are based on real adventures my family has had, and you’ll see even more in future books. Of course, I may not be willing to admit that the really embarrassing ones happened to us. Previously, you have written for Love Inspired Historical, but your newest release is a contemporary story. Has the fact that your books now take place in the present impacted your writing process? The biggest impact it’s had is with my word count. In case you haven’t guessed, I like to use my words. Losing 20,000 words to tell a story was really rough. I’ve had to spend a lot more time in the prework stage to solidify and condense ideas. Even so, I’m still learning to cut more of my darlings, and as I’m plotting my next series, I’m much more mindful of making things less complicated so I can do the story justice in a smaller space. In your own words, can you describe what defines Harlequin Love Inspired? The way to define Harlequin Love Inspired is the Christian faith element. A person’s faith is integral to who they are as people- regardless of what that faith is. Even if you have no faith, that belief informs who you are and why you make the choices you do. So, for Love Inspired, you’re going to see a lot of the character growth and their decision stem from their Christian faith journey. My biggest advice is to read a lot in the genre you want to write in. This is especially important when you want to write for Harlequin. I could be the next J.K. Rowling, but if I submit Harry Potter to Love Inspired, they’re not going to buy it. I talk to a lot of writers who haven’t done their homework, and then they get mad when their books don’t sell. Along with that, make sure it’s a genre you love. If you don’t love the genre, it’s going to show in your writing. The other piece of advice I have is to write a lot. Most people don’t sell the first book they’ve ever written, and like anything else, writing takes practice. You might be a good writer now, but you can always get better. If your first book doesn’t sell, put it away and write something else. I know it’s hard, because you love that book. But, having written 8 books for Love Inspired Historical and now 3 for Love Inspired, I can look back at my old rejections and tell you exactly why they didn’t sell. So, just keep writing and don’t give up. Be willing to learn, and you will end up selling! Finally, if you do want to write for Harlequin, I strongly recommend you join our Harlequin Writing Community on Facebook: https://www.facebook.com/groups/HarlequinWritingCommunity/. You’ll meet a lot of other aspiring authors as well as authors who currently write for Harlequin who are there to support and encourage you along the way. Hey, Danica. Great, insightful interview! Congrats on the latest LI release! I really love having that category to focus on. I have so many ideas that I’d otherwise be all over the place! Thanks so much Chrissie! I know that, with your hard work and dedication, you’ll get there, too. Persistence pays off! Great article! I am just a reader but I always enjoy reading about authors and their road to publication! Thanks so much for stopping by, Connie! I’m glad you enjoyed this! This lady is an inspiration! Danica writes, advises and encourages, as well as running home and family. I’m looking forward to reading her books (only just arrived on Harlequin and discovered her) Thank you, Danica.